Well of course in making the drink menu this one, the level of precision and patience is a major factor. The level of accuracy means that when you choose a menu ingredients this one should be as fresh as possible to increase the quality of your drinks. Patience is how you can divide the cooking time with the right management. The following picture is a complete drink menu. Gravy, boiled milk, salt, and pandan leaves, stirring until boiling and mature. Set aside. Mix the pearl sago, cassava, black grass jelly, jackfruit, kolang forth, young coconut, and avocado. Stir well. 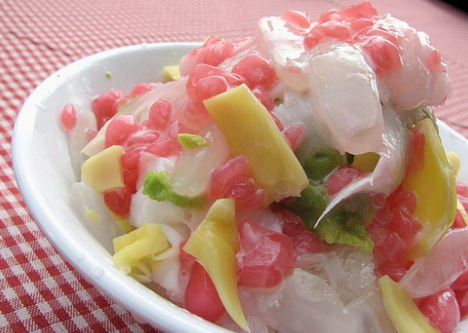 Serve the mixture sago pearls with shaved ice, sweetened condensed milk, syrup cocopandan, and coconut milk. 0 Komentar Untuk "Recipes Make Ice Mixed Drinks"